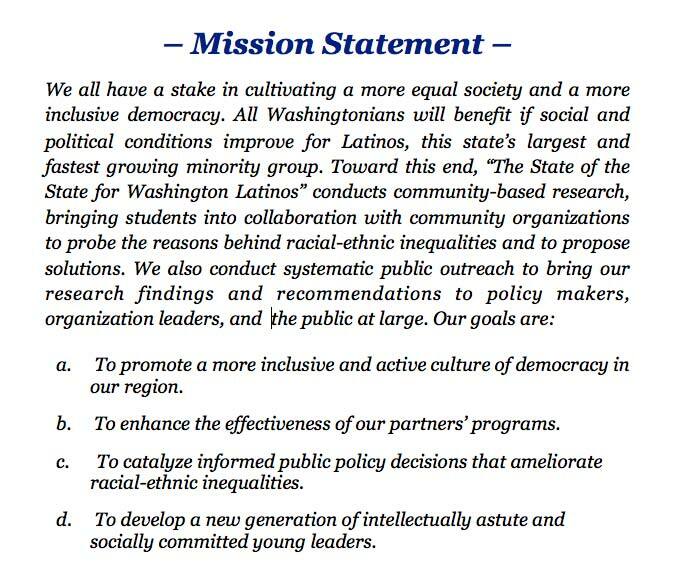 This project examines the impact of Head Start enrollment on Latino students in Washington State. Latino families are more likely to be living below the poverty line and to have the lowest level of education of any other group in the state. Their children enter school with undeveloped basic academic skills, which frustrates their progress and contributes to high drop out rates. For the past forty years Head Start has been the federally funded answer to the academic challenges of disadvantaged children, and it’s ability to remain effective is tied to the program’s capability to adapt to the needs of the growing Latino community in Washington. Methods: I researched published information and studies on the benefits of preschool, the Head Start program, and the educational barriers which face minority and poor children. I collected and compared last school year’s National Reporting System test scores from several programs throughout the state, to both each other and to averages from Head Start programs across the country. I also conducted a survey of Walla Walla Head Start parents and two local interviews to supplement discussion of Head Start’s impact on the academic performance and home learning environment of Latino students. Findings: Head Start can positively impact the performance of Latino children both in the short and long term. A case study of the programs offered by Walla Walla’s Head Start program to parents demonstrates the influence of an educational approach which engages the parents. However, this research also suggests that troubling achievement gaps persist between Latino students and their classmates, despite enrollment in Head Start; I argue that the restricted language capabilities of many Latino families impact the scholastic performance of their children in a variety of ways. Increase support for teachers, including providing funding for Spanish-language training.